Authorized HP LaserJet Enterprise M501, M506 printer repair and LaserJet M501/M506 printer service error code repairs in Los Angeles, Orange County and Riverside County, Ca. Fast on-site LaserJet M501, M506 service error code repairs in Southern California. 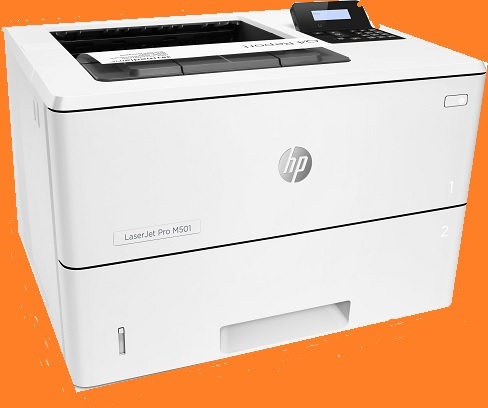 We specialize on HP LaserJet Pro M501 as well as M506 printer repair in Los Angeles and Orange County with image defects, vertical lines, horizontal lines, repeating dots, M501 printer error messages and M506 pinter maintenance error codes. We provide fast onsite Laser Jet Pro M501/M506 printer maintenance service in Southern California. Our technicians have the knowledge and technical ability to repair Pro M501 and Pro M506 printers. We offer 6 months warranty on LaserJet Pro M501/M506 printer repair service in Southern California. We carry most common HP Pro M501/M506 printer parts to repair hardware failures and service numerical error code on the first visit. We solve all HP LaserJet Pro M501/M506 print defects with vertical lines, Horizontal lines, smeared prints, toner not bonding to the paper, dirty printing, image defects, grinding noise and repeating dots. Our onsite printer techs carry HP LaserJet Pro M501/M506 Fuser Unit, HP Pro M501/M506 Maintenance Kit, Roller Kits, paper cassette trays, Registration Assembly and Pickup assembly. We sell HP LaserJet Pro M501 and M506 87A/87X toner cartridges with FREE delivery in Los Angeles and Orange County! The LaserJet Pro M501 prints at 45 pages per minute on Letter size paper! Fast onsite HP LaserJet M501 as well as Pro M506 printer repair in Southern California by Zip Codes! Same-day on-site HP LaserJet M501/M506 series printer service in LA and OC! We stock LaserJet M501/M506 Maintenance kits in stock to provide same-day printer service on HP LaserJet M501 and M506 printer with 50.1, 50.2, 50.3, 50.4 and 50.5 Fuser Errors. We provide fast on-site HP laserjet M501/M506 printer repair with 13.1/13.2 Paper delay jam at paper feed area, 13.20/ 13.21 Paper jam in the paper path, 13.5/13.6 Paper jam in the fuser, 13.10/13.22 Jam inside duplexer and 13.20/13.21/13.32/ 13.33 paper stopped jam in the path. All OEM HP LaserJet M501 and M506 toner cartridges are assembled by HP for use in your M501 and M506 laser printers. Also known as "genuine" toner, these cartridges provide a premium alternative to compatible or re-manufactured laser toner cartridges.